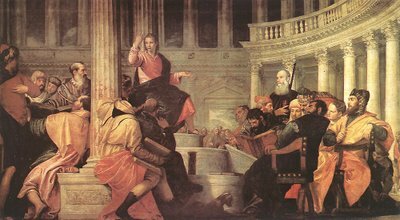 Today, Jesus shocks the Jewish chief priests by telling them something about themselves that no one else would have dared to say. What was it? Our reading is in a portion of St. Matthew’s Gospel that reports on the tangles Jesus had with the religious leaders of Jerusalem. In the preceding verses, they questioned His authority to enter the Temple to teach (see Mt 21:23). He answered their question with a question of His own first: “The baptism of John, whence was it?” They refused to answer, of course. If they said, “From God,” then Jesus would embarrass them by asking why they didn’t believe him. If they said, “From men,” the people would be up in arms. They pleaded ignorance, thus forfeiting any explanation of Jesus’ authority. Now, Jesus asks them another question. He describes a man’s two sons. The first one refuses to obey his father’s command to work in the family vineyard, but later he has a change of mind and does the work. The father gives the same command to the other son, who is the picture of docility with his answer of, “Yes, sir,” but then he never actually does the work. Jesus asks, “Which of these two did his father’s will?” The religious leaders can recognize true obedience in this story. They know that words alone don’t count. Surely they are not expecting what comes next: “Amen, I say to you, tax collectors and prostitutes are entering the kingdom of heaven before you.” There could not have been a more withering insult than this to men who prided themselves on being the spiritual leaders of God’s people! Tax collectors and prostitutes were sinners on the lowest rung of Jewish society. So, how on earth would they be ahead of those in positions of religious authority? We should note that Jesus told His critics that sinners who changed their ways would enter the kingdom of Heaven “before” and not “instead” of them. There is good news here, even in His stinging rebuke. Men and women who stray far from the Father’s will can always return. It is never too late to repent. Possible response: Lord Jesus, I would rather talk than act. Help me change my ways. In these verses, the LORD says His people charge Him with not being “fair.” Why would they say that? They are unhappy because the Lord announced that even though a man be thoroughly wicked, if he “turns away from all his sins which he has committed and keeps all My statutes and does what is lawful and right…none of his transgressions…shall be remembered against him” (see Eze 18:21-22). The reason for God’s willingness to put the former sins away is simple: “Have I any pleasure in the death of the wicked…and not rather that he should turn from his way and live?” (see Eze 18:23) God wants His people to live; when they choose life for themselves and live according to His commands, He is more than ready to forget their earlier disobedience. Alas, God’s people often have longer memories for the sins of others than God; they prefer to simmer over previous failings rather than forgive them. Yet what really stoked the charge of “unfair” among God’s people was when He told them that a man could have many “righteous deeds” to his credit, but if he turned from them to do evil, “none of the righteous deeds which he has done shall be remembered” (see Eze 18:24b). Just as the slate gets wiped clean for those who turn from sin to righteousness, so does it gets wiped clean for those who turn from righteousness to sin. All our choices in life matter. A choice to live righteously will always trump the choice to sin. No one who repents is barred from heaven because his former life was dark. No one who repudiates righteousness is welcomed into heaven on the strength of previous good deeds. Action always speaks louder than words. Possible response: Heavenly Father, help me to be as forgetful of the sins of those who repent as You are. At this point in our reading, we might ask, “How is it that God can wipe clean the slate of sin in a man’s life when he repents?” St. Paul gives us the answer: Jesus, the Son of God, humbled Himself on our behalf and became obedient “to the point of death” so that we could be forgiven, washed clean from our sin. The forgiveness offered by God in the Old Covenant was given in anticipation of this event; in the New Covenant, it is accomplished, through Christ’s death and resurrection, and offered to all people, everywhere, in all times. God’s forgiveness was not cheap. Having paid its great price, why wouldn’t He want all sinners to embrace it and make a fresh start? That is why the Church never tires of calling mankind to repentance and belief in the Gospel. She wants “every knee [to] bend” and “every tongue to confess that Jesus Christ is Lord, to the glory of God the Father.” This is what it means to do the Father’s will and so enter the kingdom of heaven. Possible response: Lord Jesus, You won forgiveness for my sins through Your humble obedience. As You died for me, help me die for You.